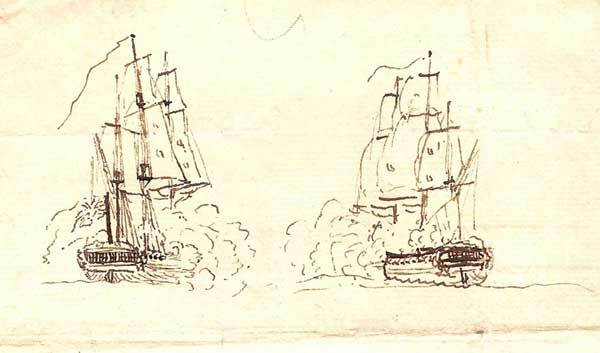 Two ships exchanging broadsides drawn by Francis Godolphin Bond on the bottom of the back page of a March, 1794 letter written while commanding the ship Prompte as a Lieutenant. 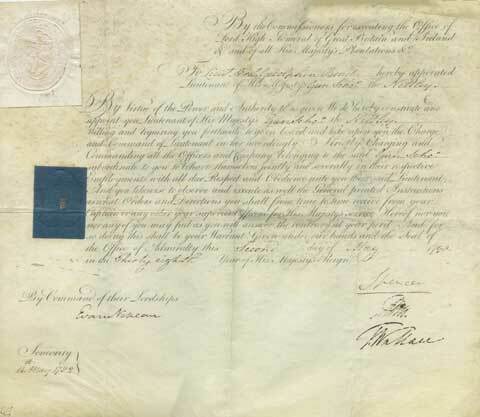 The letter is a request for a promotion, see how it was done in the Royal Navy in 1794. This is the only drawing by Bond we have in our collection. Paper and postage was expensive, so expensive that, as you will see when we upload them, the paper was sometimes written on twice, in two directions, to save paper and postage. Francis Godolphin Bond, what a name. You would think his parents were Miami Dolphin fans, or had a premonition he would go with the dolphins. A proper precurser of the more modern James, he performed many impossible feats during his time with the Royal Navy, including some time serving with his uncle Captain Bligh. My wife, Alison Pryce, a descendant of Francis Godolphin Bond, has a collection of letters written by Francis Godolphin Bond AND written by people writing to him. Also the original commission of Francis Goldophin Bond in 1782. We have about 80 letters, written during Francis's service with the Royal Navy. Preserved carefully for over 200 years, Alison has scanned these documents, and we are now publishing them on Sailing Texas in pdf format. As you read about the service of Francis Godolphin Bond, and we update this page, you will see many links in the allow you to view the actual document in very good resolution. By using the Adobe Acrobat Reader, you can magnify the image and examine the penmanship closely. More to come, last update 2/5/08. Bond received his commission as a Lieutenant in May of 1782. This is a very interesting document, remember this was in 1782, 300 years after the invention of the printing press. On careful examination, by comparing identical letters at various places in the commission, you can see they are not exactly the same, so it does appear that this commission was penned by hand, by a scribe with very very good penmanship. To check yourself, just click on the picture and download the pdf file which you can magnify with the Adobe Reader. The Napoleonic Wars took place mainly in Europe but also involved some other parts of the world. The wars were sparked by the French Revolution of 1789. These wars revolutionized European armies and played out on an unprecedented scale, mainly due to the application of modern mass conscription. Napoleon's empire ultimately suffered complete military defeat. December 18, 1790, Letter from the Admiralty naval agents to Francis Godolphin Bond. January 6, 1791 letter to Bond denying his request for traveling expenses. October, 1793. Drafts from Francis Godolphin Bond to Sir Hyde Parker and Lord Chatham seeking help. March, 1794. written while commanding the ship Prompte as a Lieutenant. December 17, 1794. Burges Ticket In favours of Lieut. Godolphin Bond(Bond was made a Freeman of the City of Inverkeithing). July 6, 1797. Draft of letter by Francis Godolphin Bond in 1797, to Lord Spencer at Spithead, asking for promotion. March 9, 1798. Letter to Francis Godolphin Bond from his aunt M. Bond. August 29, 1798. Two letters drafted by Francis Godolphin Bond in 1798, while at Haslar Hospital, complaining about the Netley's fitting out. September 12, 1798. Draft of letter by Francis Godolphin Bond, while at Haslar Hospital, to Lord Spencer. 1798. Letter to Francis Godolphin Bond from Admiral Keith. January 8, 1800. Letter from the Admiralty. Bond may get early promotion. December 11, 1800. Letter from Lord Spencer to Francis Godolphin Bond, promotion to Commander. December 11, 1800. Francis Godolphin Bond, comission to Commander. March, 1802. Letter to Francis Godolphin Bond the Admiralty promoting him to Post Captain. July 14, 1802. Letter to Francis Godolphin Bond from his aunt M. Bond. December 26, 1802. Letter from Francis Godolphin Bond to Lord St. Vincent. May 16, 1816. Letter from Rear Admiral Hope in 1816 about Bond being blown up in 1779. May 20, 1816. Petition that Francis Godolphin Bond sent to Lord Melville, asking for a pension. The log written by Francis Godolphin Bond, while serving under Bligh on HMS Providence on the second breadfruit voyage in 1797, now resides in the Public Record Office, London. The Mutiny on the Bounty occurred on the first breadfruit voyage, 10 years earlier, to transfer breadfruit plants from Tahiti to the West Indies. This was intended to be cheap feeding for the sugar plantation slaves. HMS Providence was commissioned for the same task. Bond was first lieutenant to Bligh. In the log, it was noted on Nov. 28th 1792, three weeks before reaching St. Helena, "squally within board and without." The underline is Bond's. In the log, the absence of punishments is very remarkable. In spite of the monotony of the voyage and "portable soup and thick gruel" every day for breakfast for two years, only the following were noted in the log. 11 May 1792 James Coombe, marine, 12 lashes for having carnal knowledge of the body of a young native woman when infected with venereal disease. 27 Dec 1792 John Carvey, seaman, 8 lashes for insolence to a superior. John Latbie, Mr. 8 lashes for neglect of duty. 4 Mar 1792 Richard Upsdale, seaman 6 lashes for theft. Richard Franklin, seaman 6 lashes fro theft. 27 May 1793 Richard Upsdale 12 lashes for neglect of duty. 14 June 1793 George Thompson 12 lashes for contempt and disobedience of orders. Most of these punishments occurred while the Providence was lying moored off Jamaican ports when discipline would be liable to be strained. Bligh was not known to be a "flogging captain." Francis Godolphin Bond, First Lieutenant (Bligh's second in command) in the Providence on the second breadfruit expedition (August 3, 1791, to August 7, 1793). He was Bligh's nephew and was his protege. He had a successful career in the navy and distinguished himself as commander of the schooner Netley, 1799-1801, when he captured several French and Spanish privateers and recaptured English ships from the enemy. When Francis Godolphin Bond joined the Royal Navy on July 1, 1772, on H.M.S. Monmouth, as "Servant" to Captain Keith Stewart, he was not quite eight years of age. When he was nine years of age he served in H.M.S. Torbay as "Surgeon's Assistant, A.B., and Captain's servant, walking the quarter-deck" and corporal on July 4, 1774, serving later in like capacity on H.M.S. Southampton, Blenheim and Crescent. On July 1, 1779, Francis Goldolphin Bond was promoted to midshipman, serving in turn on H.M.Ss. Crescent, Dunkirk, Rattlesnake, Artois, Tartan, Crescent again and Minerva. While serving as midshipman in the Crescent he was very severely burned by an explosion of loose gunpowder in a prize, from which accident his face was somewhat disfigured and his hands partly crippled. "We have examined Mr. Fras. Godpn. Bond, who by certificate appears to be more than twenty-one years of age (he actually was only seventeen) and find he has gone to sea more than seven years in the ships and qualities undermentioned". "He produced Journals kept by himself in the Dunkirk, Crescent and Minerva, and Certificates from Captains Hope, Milligan, Pakeham and Bligh of his Diligence and Sobriety. He can Splice, Knot, Reef a Sail, Work a Ship in Sailing, Shift his Tides, keep a Reckoning of a Ship's Way by Plain Sailing and Mercator; observe by Sun or Star, and find the variation of the Compass, and is qualified to do the Duty of an Able Seaman and Midshipman". On the last date, through the recommendation of Captain Bligh, as we learn from the correspondence, he was appointed First Lieutenant H.M.S. Providence, then about to leave London on the Second Breadfruit voyage to the South Seas. Of his activities on this voyage, we have ample evidence, first because he kept a private log; now preserved in the Public Record Office, London - a small, thick volume, closely written and illustrated by five small sketches and a number of sectional views of islands. To a portion of the Barrier Reef, near Bligh's Entrance, Captain Bligh gave the name of Bond's Reef. His first appointment, then, after the return of the Providence, was as First Lieutenant on H.M.S. La Prompte, and then in succession to H.M.Ss. Active, Arrow, La Pompee, and as Lieutenant and Commander on May 13, 1798, to H.M.S. Netley, a new and fast gun-brig armed with 16 24-pounders and with a complement of 60. In the autumn of 1778 the Netley was employed off the French coast, and Lieutenant Bond, her commander, was severely wounded by a shot from a shore battery at Le Havre. At the end of 1799 she was transferred to the north coast of Spain, where, says James, the naval historian, her commander "distinguished himself greatly by his activities in capturing privateers and in protecting British convoys from depredations ..... We shall (says James) pass over several cases in which the Netley captured Spanish privateers and re-took their prizes to relate one instance of decided gallantry on the part of the commander and crew". On November 7, 1800: "Being off the rock of Lisbon, Lieutenant Bond received information that a Spanish privateer-schooner was lurking in the neighbourhood, and that the vessels of the Newfoundland convoy, being dispersed, were expected daily to reach the Tagus. Having, in the evening, stood in close to the shore, the Netley, after dark, discovered the above privateer, and a brig-prize which she had that morning made, at anchor. Despatching her boat to take possession of the brig, the Netley gallantly ran on board and, dropping her anchor, carried without the discharge of a shot or the loss of a man, the Spanish privateer San Miguel, alias L'Alberta, of 9 guns, described as 18 and 6 pounders, and 65 men. With these her two prizes, the Netley, on the 8th, anchored in the Tagus". In all in 1800 the Netley brought in 45 prizes, included among which were 19 armed privateers, and a "treasure ship", La Reina Luisa valued for prize at 24,000 pounds - a fitting reward for her commander's hard service. F.G. Bond was appointed by Lord St. Vincent to the rank of Commander on December 11, 1800, and had therefore to relinquish command of the Netley, and to return home. In April, 1802 he was further promoted to Post Captain. In July, 1803 he was appointed to the Sea Fencibles (the body raised to defend the English coast against a French invasion), where he must undoubtedly have come into close contact with the founder and first Governor of New South Wales, Admiral Arthur Phillip, for in that year the latter was in command of the whole of the Sea Fencibles, with jurisdiction over the entire coast line of Great Britain. Bond was never afterwards in command afloat, but became a Rear-Admiral at the general promotion of January 10, 1837. Rear-Admiral Francis Godolphin Bond died at Exeter on October 26, 1839, aged 74.